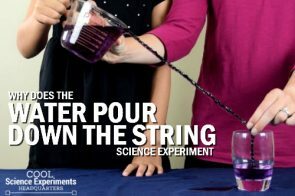 Here’s a simple and fun science experiment that can be used to teach children about Action and Reaction. The force from the air moving in one direction propels the balloon in the other direction, much like a rocket. The supplies needed are everyday household items so there is a good chance you have everything you need to conduct the experiment already on hand. 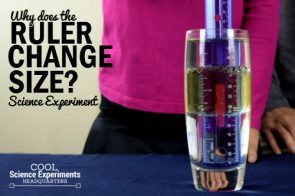 My kids really enjoyed this simple experiment and had fun doing it over and over with balloons of different shapes and sizes. Tip: Make the experiment even more interactive and have your kids try to race the balloon across the room! Two objects of the same height that you can tie a string to. I used chairs. Step 1 – Position two objects of the same height (I’m using chairs) about 10 feet apart and grab a piece of string. Step 2 – Tie one end of the string to one of the objects. Make sure it is securely fashioned. Step 3 – Next, get a straight plastic drinking straw. If the straw is one of the “bendy” straws with the flexible piece, cut off the flexible part so you are left with a straight straw. Note: Be sure to position the two pieces of tape near the middle of the straw. If you put them near the ends of the straw it will bend when you blow up the balloon and the rocket won’t move as quickly. Step 6 – Tie the loose end of string to the back of your second object (I’m using another chair) and make sure the string is tight. If the string isn’t tight, move the objects farther apart until it is. Step 7 – Blow up the balloon and hold the end so the air can’t escape and use the two pieces of tape to secure the balloon to the straw. Step 8 – Move the straw and balloon to one end of the string. And once you are ready….. Step 9 – Let go of the balloon and watch as it rockets across the string! Then inflate the balloon again and repeat again and again. As the air is released out of the balloon in one direction, the force propels the balloon in the other direction. The result is the balloon flying across the string like a rocket! Position two objects of the same height (I’m using chairs) about 10 feet apart and grab a piece of string. Tie one end of the string to one of the objects. Make sure it is securely fashioned. Next, get a straight plastic drinking straw. If the straw is one of the “bendy” straws with the flexible piece, cut off the flexible part so you are left with a straight straw. Place two pieces of tape on the straw. Note: Be sure to position the two pieces of tape near the middle of the straw. If you put them near the ends of the straw it will bend when you blow up the balloon and the rocket won’t move as quickly. Tie the loose end of string to the back of your second object (I’m using another chair) and make sure the string is tight. If the string isn’t tight, move the objects farther apart until it is. Blow up the balloon and hold the end so the air can’t escape and use the two pieces of tape to secure the balloon to the straw. Move the straw and balloon to one end of the string. And once you are ready…..
Let go of the balloon and watch as it rockets across the string! Then inflate the balloon again and repeat again and again. you balloon rocket is so cool! The balloon wind is pushing against the regular wind which makes it fly and the rope is inside the straw which also makes it go faster.